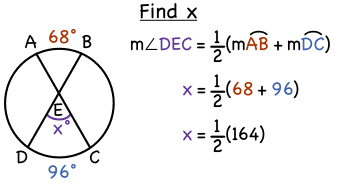 This tutorial shows you how to use your knowledge of intersecting chords in a circle to find a missing angle measurement. This tutorial shows you how to use your knowledge of intersecting arcs in a circle to find a missing arc measurement. Take a look!